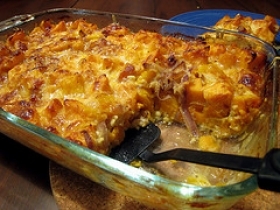 Have you made Calico Squash Casserole? 1. Combine first 3 ingredients in a medium saucepan; bring to a boil. 2. 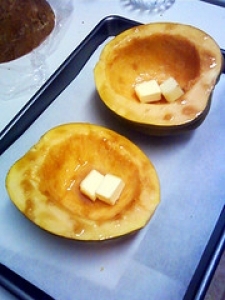 Cover, reduce heat, and simmer 8 minutes or until squash is just tender. 3. Drain and set aside. 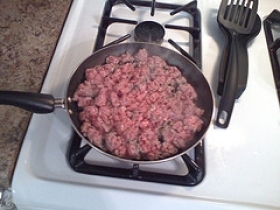 Saute onion, green pepper, and green onions in 1 tablespoon butter until tender; set aside. 4. 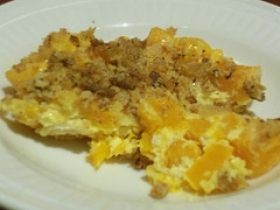 Combine stuffing mix and remaining 3 tablespoons butter in a large bowl; reserve 1/3 cup mixture. 5. 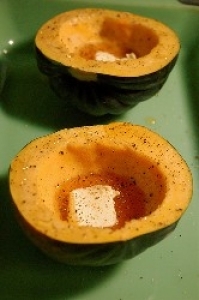 Combine squash mixture, onion mixture, soup, and remaining ingredients; spoon mixture into a lightly greased 12" x 8" x 2" baking dish. 6. 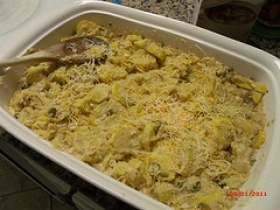 Sprinkle with reserved stuffing mixture. Bake at 350 F for 30 minutes or until casserole is thoroughly heated. This recipe is high in Vitamin A with 43% of your daily recommended intake per serving. This recipe is high in Vitamin C with 24% of your daily recommended intake per serving. This recipe contains potential food allergens and will effect people with Wheat, Yogurt, Gluten, Bell Pepper, Spring Onion, Onion allergies.